In a bid to inspire, motivate and encourage the Staff to do more, Management of the Nigerian Ports Authority recently rolled out the drums and brass band to celebrate her workers for their hard work, dedication and commitment to duty. 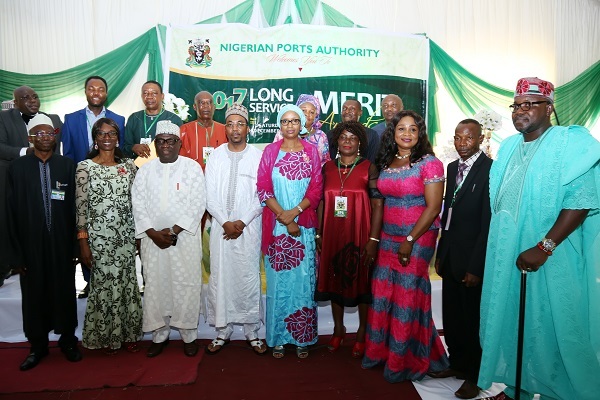 At the event which was hosted by the Managing Director, Hadiza Bala Usman, a total of 567 Staff from all the Port locations across the country assembled at the NPA Sports Ground, Bode Thomas, Surelere, Lagos to receive their awards. A few of the staff got Merit Awards and special recognition for hard work and bravery in Fire-Fighting. Usman assured the workers of her Management’s commitment to better their welfare in the coming years and called on them to continue to exhibit the traits of hard work to surpass precious records. She applauded most especially the 30 gallant Firemen who were able to combat the recent fire outbreak in one of the Nation’s Seaports. This, she enthused is worthy of emulation in view of the colossal loss of lives and equipment that were prevented during the incident. In her post-event interaction with the media, the Managing Director said work on the Port access roads were on course, adding that large funds were being expended to clear the mess and make the roads accessible for efficient Port operations. She further said that her Management was keen on entrenching accountability and efficiency at Port locations across the country to improve the turn round time of vessels, improve Executive Orders that will reduce delay at the ports. The MD called on the workers to remain faithful to their work ethics in order to take the Maritime Industry to greater heights. Earlier in his brief remark, the Executive Director, (Finance and Administration), Mohammed Bello-Koko while welcoming the recipients and invited guests to the occasion, stated that this year’s event was a follow up to the Maiden Edition held last year to further express Management’s recognition and appreciation to the Commitment, Dedication and Punctuality to duty of the workforce towards the realization of its goals and objectives. He thanked the recipients at the event for their commitment over the years in the area of Nation building. The President of the Senior Staff Association of Communications, Transport and Corporations (SSACTAC), Benson Adegbeyeni thanked Management for instituting the Long Service and Merit Award Ceremony. He assured Management of the improved cooperation and support of the workforce towards Nation building and the actualization of its cardinal thrusts. Responding on behalf of the entire Awardees, the Port Manager, Calabar Port, Mrs. Funmilayo Olotu while thanking Management promised that they would take the Organization to another level worthy of emulation in line with International best practices. The Executive Director, Engineering and Technical Services, Prof. Idris Abubakar was represented at the event by General Manager, Maintenance, Engr. A. A. Jatto. Other present at the occasion were General Managers, Human Resources, Yahaya Bukar, Information and Communication Technology (ICT) Obumneme Simeon Onuenyenwa amongst others.